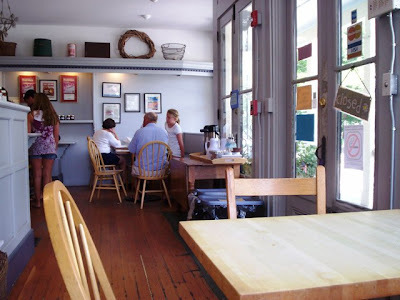 Thanks to the rave reviews from the guys at Jesse James Antiques in Bristol, RI, Mom and I have been hooked on the sandwiches and cookies at Provender for the last month. We had been driving by this restaurant for years as it is located diagonally from the immensely popular Gray’s Ice Cream at Tiverton Four Corners. 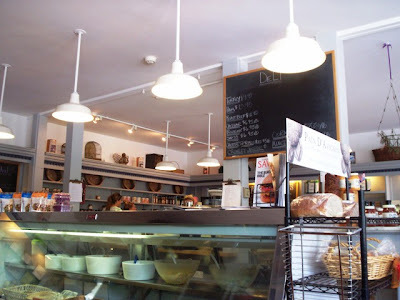 I have been trying to get a review on each of my visits, but due to Provender being extremely crowded, there was no way that I could sneak a photograph without being seen. To my surprise, I was finally able to get something on today’s visit. I pulled into the back parking area at around 1:30 p.m., and happily watched a guy slip in the dirt as he tried to beat me to the door. That’s what you get for trying to cut me off! The inside of Provender is quite adorable, however, I wasn’t able to get a shot of the delicious baked goods or the ordering window as the lunchtime yuppy crowd couldn’t seem to get out of the way. You know the type – they like to be seen and heard – and they don’t care if you’re trying to order a sandwich or perform CPR on someone. Just don’t interrupt their ridiculous stories of self-indulgence and posh living. Once I made my way through the crowd, I found myself at the sandwich window. Now, the thing about getting sandwiches at Provender is that you have to order at the back window, pay for them at the front cash register, and then bring the receipt back to the window when your number is called. A lot of walking around, and I don’t mind the exercise except for the fact that I always have to walk through a sea of people on each trip. A little annoying, but the sandwiches are well worth it. 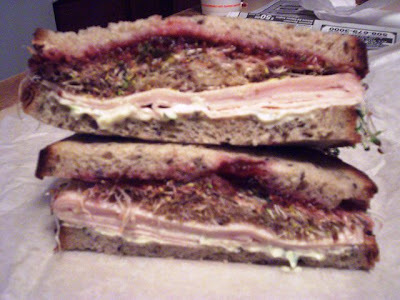 Scarlet Letter – Turkey, cranberry sauce, tarragon mayonnaise, and alfalfa sprouts. Brideshead Revisited – Roast beef, cheddar cheese, lettuce, and horseradish mayonnaise. Freudian Slip – Black forest ham, honeycup mustard, garlic and herb cheese, and spinach. Doctor Bombay – Curried chicken salad, mango chutney, and lettuce. Mama Mia – Turkey, roasted red peppers, provolone cheese, roasted garlic and basil mayonnaise, lettuce, and tomatoes. Queen of Hearts – Tuna with black olive tapanade and artichoke hearts, lemon mint hummus, red onion, and lettuce. Piggly Wiggly – Black forest ham and Swiss cheese with your choice of condiments. Great Garbonzo – Spicy orange hummus (contains peanut butter), lettuce, spinach, red onions, cucumbers, alfalfa sprouts, and tomato. Howdy Doody – Peanut butter and jam with gummy bears. I was greeted by a friendly girl who took my sandwich order. Now, I’ve only had two sandwiches here so far – Scarlet Letter and Doctor Bombay. Both sandwiches were some of the best I’ve ever eaten, but after reading a great story on the Internet about someone happily reacquainting himself with a Scarlet Letter after being out of the area for 20 years, I decided that this would be my feature sandwich. 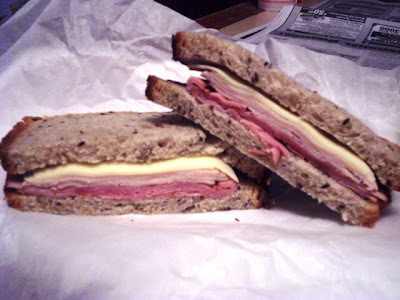 For Mom, who is not a fan of some of the ingredients in Provender’s specialty sandwiches, I custom-ordered one with ham, turkey, and provolone cheese. She has had a Piggly Wiggly in the past, but had the honeycup mustard as one of her condiments and found that it was way too hot to have been layered on so thick. For both sandwiches, I chose a seven-grain bread which I think they make right on the premises. I took my receipt (I was number 81), and headed for the cash register. 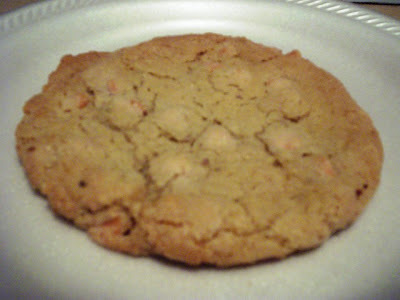 While I was there, I ordered two of their splendid cookies – the butterscotch chip and the cowboy ($1.95 plus tax). My total came to $20.20. See what I mean? That’s quite an expensive lunch. I’ll probably have to stop coming here as my unemployment check only stretches so far, but when I get extra money, Provender is definitely one of the places I’d like to spend it in. My cookies and I had a seat at one of the few tables at the front of the restaurant. There are also several benches located on the outside porch where you can have your lunch while watching the traffic pass by. Inside, the light blue wall color and bright, clean décor sort of gives Provender a beachy vibe. Right next to me was a shelf with a lot of different “things to do in Rhode Island” type pamphlets. Also next to me was a large drink cooler and the deli case containing all the meats and cheeses waiting to be sliced. I wasn’t getting drinks here, but in the past I did order an iced coffee which was quite a sight because the ice cubes were not ice at all – they were cubes of frozen coffee! I love this idea because, when the cubes melt, they won’t water down your drink. Love it! Like I said, you pay a lot, but you get a lot. I still wish that I could have taken a picture of the dessert area. All of the homemade cookies are kept in glass containers, and there are several trays of small bundt cakes, brownies, muffins, candy, and other delicious items scattered across the counter that really make your mouth water. Mom and I have only tried the cookies (chocolate espresso, ginger snap, peanut butter chocolate chip, chocolate chip, and oatmeal ginger), but boy were they outstanding. So fresh, so rich, and so chock full of chocolate, fruit, and to our surprise, nuts! I’m glad that Provender isn’t afraid to use nuts in their cookies (with a warning on the jars – just in case). Just because some people unfortunately have food allergies doesn’t mean that everyone has to suffer! After my number was called, I grabbed my bag and headed out to the car. I put all of the food into my freezer bag because it was around 90 degrees and I had to drive them all the way back to Fall River. I didn’t spend over $20 only to have the mayonnaise curdle on the way home. When I got home and removed the perfectly preserved sandwiches and cookies from the cooler, Mom and I dug in. Boy, what a difference quality makes! Even though most would have considered Mom’s custom sandwich to be on the plain side, she found it to be fantastic. The two deli meats and the provolone cheese were cool, fresh, and tasty, while the bread itself had a nice chew to it yet stayed very soft. Mom agrees that you really get your money’s worth with a Provender sandwich. She knows a lot of people – not herself, of course – that would be satisfied with just one half. Bottom line, Mom wouldn’t feel cheated paying $7.90 for something so delicious. My Scarlet Letter tasted just as good as I remember. The turkey was lean, the cranberry sauce was more sweet than bitter, and the alfalfa sprouts gave the sandwich a slight crunch. Also, the tarragon mayonnaise – although spooned on a little heavily – had a great creamy texture. The sandwich could have been horribly messy if not for the strong bread keeping it altogether. Not a drop of anything escaped, and – like Mom’s sandwich – mine could have also been shared ... but wasn’t. It was delicious and I can see why the gentleman who wrote the Internet review has remembered it fondly over the years. I’m not even that big a fan of cranberry sauce, but in the Scarlet Letter, it works perfectly. Like before, our two cookies were Heavenly. The butterscotch chip has become our new favorite. 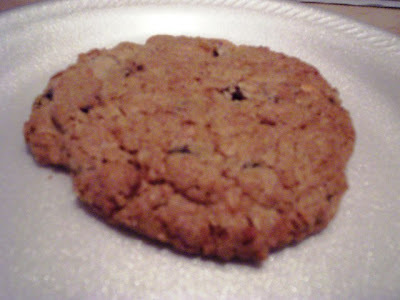 It has a lightly sugared top and is filled with sweet butterscotch chips and nuts. The cowboy is a concoction of several different ingredients like chocolate, fruit, oats, and nuts. They were both excellent. 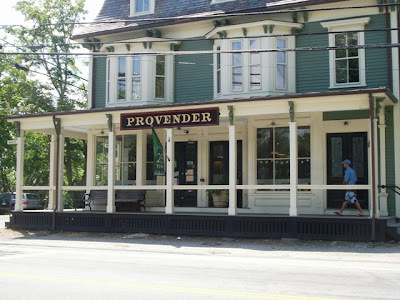 The only complaint that Mom and I have – aside from the sometimes annoying crowd inside – is that Provender tends to overdo it with their sauces and condiments. We don’t want to lose the taste of the meats and vegetables, so perhaps they could ease up on the dressings. Other than that, we can’t think of a reason for anyone not to visit Provender, whether for lunch or just one of their huge cookies. 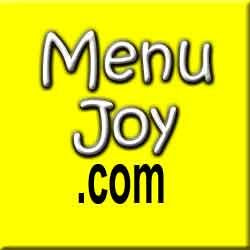 It is definitely worth the drive and the money, and we can see why it is such a favorite with locals. Provender is open from 9 a.m. to 5 p.m. daily.